This non-fiction economics type book is definitely not an apology for the top 1% of the 1%. 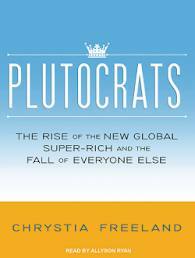 Freeland, an economic journalist (Editor of Thomson Reuters Digital) has written a pretty unsparing look at the attitudes and lifestyles of the super-rich around the world, with a focus on the US. This growing disparity is what Freeland explores in today’s world saying that the gap between rich and poor is greater than at any time since the Gilded Age (late 19th century – robber barons). She details how these top-enders self-made their billions in various ways depending on their countries and the availability of “rent-seeking” or living off the by-products of wealth creation – government contracts, privatization, personal contacts, banking and stock investments. Only those top 10 individual slots of wealth (not percent) can afford to be magnanimous – the rest apparently want more money (so they can have the private jet entourage to the private Greek island) and resent anyone or anything which stands in their way. I was rather appalled at the top-notchers and their unabashed self-interest, but I don’t know why I should have been – I suppose it was the personal touch, hearing the words of some of them – the reality of their selfishness.